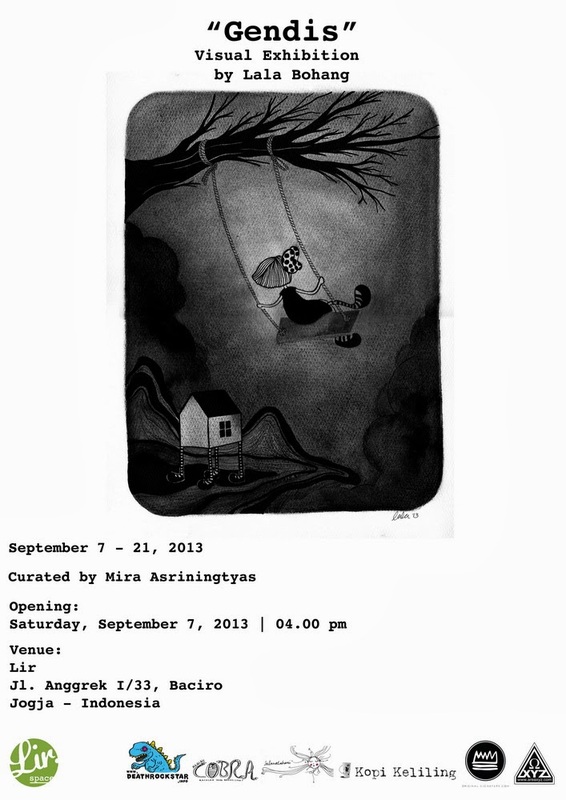 “Gendis” is the first solo exhibition of Lala Bohang. It is a story about a girl who live in a little corner of the world at the end of the rainbow. The color of the rainbow shines all the way through human's world, across the human's blue sky, and at the end of it-- there is nothing but black and white. “Gendis” adalah pameran tunggal pertama Lala Bohang. Kisahnya adalah tentang seorang gadis kecil yang tinggal di ujung dunia di akhir pelangi. Warna-warni pelangi bersinar sepanjang dunia manusia, melalui langit biru para manusia, dan di titik akhirnya—tidak ada warna lain selain hitam dan putih. This is a story about a girl who live in a little corner of the world at the end of the rainbow. The world is nothing but contrary. There is no such thing as seven colors and hundred hues. The color of the rainbow shines all the way through human's world, across the human's blue sky, and at the end of it-- there is nothing but black and white. She chose to stay at the edge of the world for she is an impatient little girl. She wanted to know how things end and what will be found at the end of everything. Being at the end of it all, she feels like she doesn't need to prepare for the next move. She owns her time all by herself. With all the time in the world, this girl enjoys her solitude like no one else. She makes the most of it. She can spend days after days, year after year doing all the thing she enjoys all by herself; seize every moment for pure joy. But, in her world there is no such thing as days or years or minutes or hours. She lives in a place when time is irrelevant. Her life is marked by phases and chapters; just like a storybook! She doesn't dream because she is dream herself. Her name, Gendis; is what they call sugar in the human land far far away. She is, of course, a very sweet girl. Gendis’ world revolves around her. It has its own will and one purpose to always make Gendis happy, to put a smile in her heart, and to always bring delightful surprises. There are times when Gendis wants to go for an adventure on a hot air balloon and her world would open its zip and there goes a balloon. There also a time when the sun is too hot and the trees around her decided to follow wherever she walks to keep her comfortable under the shade. This is a kind of world where everything is possible. Of course she is happy! Why wouldn't she? True, she lives a solitary life; but, she is never lonely. After all she always has Ibu Ikan and Pak Kucing to be by her side. Ibu Ikan(1) is a very wise fish with all ear and heart for Gendis' story. Pak Kucing are all those cats friend of her. Pak Kucing are so many she lost count of them. Their number added and lessen each now and then; but, there always at least one to stay by her side. Pak Kucing are full of love and very independent at the same time. They need each other but never depend on one another to the point where it's disturbing. They both are Gendis' dearest friends. Gendis adores them for their silent. Those cats can mew, but only as soft as a hush or a breeze. With all the music and loud conversations going on in her head, she needs her world to be silent and still. The chairs, the tables, the bed, and everything else in Gendis' house have a heart, free will, and strong legs to keep moving. Just like Gendis, her moving house also likes to travel up to the sky and down the deep sea. Nobody force them to stay where they are. They are there because they want to-- not because they have to. Sometime, some of them get exhausted standing and prefer to lay down on the floor. Sometime, they need a breath of fresh air and start embracing the nature in many ways. Their mantra is, "Stay because I want to. Do because I want to. Move because I want to. Not because I have to". This is where this part of the story started. Once upon a time, some tables decided to leave the house and not planning to return. It was unlikely. Yes, they all have their own right to come and go as they please. But, they always live a harmonious life before. Somehow, Gendis knew there is something different this time. It was as if she would never see them again. It was her first lost. There goes a pinch that leaves a trace of melancholy in a part of her heart she never knew existed. There was a part of her heart that crack when those tables left. Her world is so silent and still that the cracking sound of it can be heard clearly from the other room. Ibu Ikan knows that it will be a long phase of listening ahead of her. She was so consumed by the thought of being left behind; consumed by the fear of losing something she never actually own. She forgot that while she was busy counting her loss and healing the bruises, there are other tables and the rest of her friends who stay. Time after time she spend trying to find the logic. She spends even more time talking to Ibu Ikan. Time flows in a mysterious way that the first pain she felt start to distort. She gets busy, but not like the grown ups kind of busy that distract them from their feeling. It is not the kind of busy that makes people numb. She starts getting her hand full of all the fun things she could think of, contemplate, spending more time with those who stay, and let time does the magic. Gendis' kind of busy is what allows her to find herself, read her own mind, and meet her inner self. It was a moment of peace and fun and adventure for Gendis. The first pain of losing the tables she never actually own is long behind her. She is ready to rejoin the world and she ask for a balloon ride to a place far far away. Up, up, and away she goes. The scenery excite her, the breeze softly touch her blushing cheek, by the time she starts to feel bored, she starts to read. Then, she falls asleep. Drifted by the wind to the Lalaland. To the land where human lives. By the time she wakes up, she was surrounded by more people than she could ever imagine. She never met a single soul before, aside from Ibu Ikan and Pak Kucing. These people, twice her size; are busy walking carrying their suitcases, briskly running with their dogs, and loudly chattering laughing singing things she doesn't understand. The human world-- the Lalaland, is too loud for her. She feels exhausted and lost, she starts to fade away. It was just in time for a Daydreamer(2) to find Gendis. In that crowd, she was the only one who notice that lost little girl, looking like she almost fades away. The Daydreamer bend her knees to get to talk to her better. She takes her to a place away from the crowd so she could listen to her sweet tinkling voice. She said to her, "It's alright", and bring her back to the balloon-- back to the end of the rainbow. The Daydreamer.. it was her who tells Gendis' story and introduce her to us human. V. After Gendis Left on Her Balloon to That Moving House at the End of the Rainbow. That is how this story is written and those pictures are made(3). (1) Lala is a dedicated Pisces. Chances are.. she pictures herself as Ibu Ikan in her drawing. She's always there all ear for Gendis.. just like Gendis always there for her. Ibu Ikan can not speak and she doesn't need to. Sometimes, Gendis just needs to let it all out, to be listened, and she knows that everything will be alright. (2) The Daydreamer is me, and Lala, and all of you who will do all the trouble of bending in your knees to get to talk to Gendis better and embrace the little soul. (3) Lala Bohang met Gendis when she was looking for her true self, a phase Gendis went through a while ago. Gendis was there for her. They both enjoys their solitude. They both are romantic by heart and they made a very good friend who completes each other. Gendis makes lala feel calmer, happier, and laid back. Lala become Gendis' first human friend. When Lala met her, she was heartbroken. It was 2009 in human's world. On the contrary, it was a phase full of love in Gendis' world. Gendis was all in peace with herself and met her soulmate, Rama. The time is later known as the chapter of Rama and Gendis. Later, Lala tells the whole story of Gendis in pictures, chapter by chapter. This is the first chapter when Gendis is searching for her true self in her solitary world. Cerita ini mengisahkan seorang gadis yang tinggal di sebuah sudut kecil dunia di ujung pelangi. Dunia yang tak seindah yang semestinya. Tidak ada yang namanya si tujuh warna dan ratusan warna lainnya. Warna pelangi bersinar menghiasi dunia manusia, membelah langit biru yang elok, namun sayangnya hanya berwarna hitam dan putih. Dia memilih untuk tinggal di tepi dunia karena dia merupakan gadis yang tidak sabaran. Dia ingin tahu bagaimana hal-hal berakhir dan apa yang akan ia temukan pada setiap akhir. Jika segalanya berakhir, dia pikir dia tidak perlu melakukan apa pun lagi. Dia akan menguasai seluruh waktunya. Dengan menguasai seluruh waktu di dunia, gadis ini bisa menikmati kesunyian hebat yang tak pernah dimiliki siapa pun dalam hidupnya. Dia akan mewujudkannya. Dia bisa menghabiskan hari demi hari, tahun demi tahun untuk melakukan segala hal yang menjadi kesukaannya; menghabiskan setiap saat untuk bersuka cita. Sayangnya, di dunia yang ia kenal, tak ada yang namanya hari dan tahun, apalagi menit dan jam. Gadis ini tinggal di sebuah tempat yang tak memiliki waktu. Kehidupannya ditandai oleh fase dan bab; seperti halnya sebuah buku dongeng! Dia tidak bermimpi karena dirinya sendiri pun merupakan mimpi. Namanya Gendis; yang berarti gula di negeri nun jauh di sana. Tentu saja ia adalah gadis yang sangat manis. Gendis dikelilingi dunianya. Dunia ini mempunyai keinginan dan tujuan untuk selalu membuat Gendis bahagia, untuk menciptakan senyum di hati Gendis, dan selalu membawa sensasi yang riang gembira. Ketika Gendis ingin berpetualang dengan balon udara, dunianya mewujudkannya dan pergilah ia dengan balon itu. Ketika matahari bersinar terlalu terik, pohon-pohon di sekelilingnya akan mengikutinya ke mana pun dia ingin menapakkan kakinya, memberikannya keteduhan dalam bayangannya. Inilah dunia, di mana segalanya bisa menjadi nyata. Tentu saja dia bahagia! Mengapa Tidak? Benar saja, dia hidup di dunia yang senyap; tetapi, dia tidak pernah kesepian. Setiap saat ia selalu punya Ibu Ikan dan Pak Kucing di sisinya. Ibu Ikan(1) adalah seorang ikan yang sangat bijaksana dengan segala perhatian dan kasih sayangnya pada setiap cerita Gendis. Pak Kucing adalah seluruh kucing yang berteman dengannya. Pak Kucingnya tak tentu jumlahnya. Jumlahnya bertambah dan berkurang seiring berlalu; namun akan ada setidaknya satu Pak Kucing untuk menemaninya. Pak Kucing begitu penuh cinta dan sangat mandiri. Mereka membutuhkan satu sama lain namun tidak saling merepotkan. Keduanya adalah sahabat terkasih Gendis. Gendis kagum pada ketenangan mereka. Para kucing itu bisa mengeong tetapi hanya lembut selembut diam atau seperti angin sepoi-sepoi. Dengan segala suara dan bincang-bincang yang membuat pekak kepalanya, dia ingin dunianya diam dan diam. Kursi-kursi, meja-meja, tempat tidur, dan setiap benda lain di rumah Gendis memiliki sebuah hati, kebebasan, dan kaki-kaki yang kuat untuk terus bergerak. Seperti halnya Gendis, rumahnya yang bisa bergerak juga suka melayang ke angkasa dan menyelami lautan yang dalam.Tak seorang pun yang mengharuskan mereka untuk menetap di suatu tempat. Mereka di sana karena mereka ingin, bukan karena keterpaksaan. Kadang, mereka kelelahan dan memutuskan untuk berbaring di lantai. Kadang, mereka ingin menghirup udara segar dan mulai memeluk alam dengan banyak cara. III. Kepingan yang Menyisakan Kesenduan dalam Bagian Hatinya yang Tak Pernah Ia Sadari Keberadaannya. Dahulu kala, beberapa meja memutuskan untuk pergi dari rumah dan tidak pernah kembali lagi. Tidak seperti biasanya. Ya, mereka semua memiliki haknya sendiri untuk datang dan pergi sesuka hati. Namun mereka selalu hidup harmonis seperti sebelumnya. Bagaimanapun juga, Gendis merasa ada yang tidak beres kali ini. Seakan-akan ia tak akan pernah melihat mereka lagi. Inilah kehilangan pertamanya. Jadilah ia kepingan yang menyisakan kesenduan dalam hati yang tak pernah ia sadari keberadaanya. Ada bagian dalam hatinya yang retak ketika meja-meja itu pergi begitu saja. Dunianya begitu sepi dan masih saja suara yang meretakkan itu terdengar dengan jelas di ruangan lain. Ibu Ikan tahu bahwa akan ada tahapan panjang setelah suara-suara itu. Ia selalu terbayang-bayang oleh kenangan masa lalunya; terbayang ketakutan akan kehilangan sesuatu yang tak pernah ia miliki. Sementara ia larut dalam kehilangannya dan menyembuhkan luka kelamnya, ia lupa bahwa masih ada meja-meja lain dan temannya yang masih tinggal di sisinya. Waktu demi waktu dia menghabiskan waktu untuk menemukan kelogisan. Dia bahkan menghabiskan lebih banyak waktu untuk berbicara pada Ibu Ikan. Waktu berlalu dengan cara yang misterius, luka hati yang ia rasakan mulai berkurang. Ia menyibukkan diri, namun bukan berarti tidak bisa menikmati hidup. Ia menyibukkan diri dengan hal-hal yang menyenangkan bukan dengan kekakuan yang selama ini dikenal manusia. Ia bersenang-senang, berpikir jernih, merenung, menghabiskan lebih banyak waktu dengan teman-temannya yang setia di sisinya, dan membiarkan waktu menunjukkan keajaibannya. Kesibukan Gendis membuatnya menemukan dirinya yang sesungguhnya, memahami pikirannya sendiri, dan menemukan jati dirinya. “Segalanya baik-baik saja . . ,” katanya. Inilah saat kedamaian, keceriaan, dan petualangan untuk Gendis. Luka dari perasaan kehilangan Para Meja yang sudah lama ia miliki. Dia siap untuk kembali menikmati dunia dan ia pun meminta sebuah balon udara untuk membawanya ke sebuah tempat nun jauh, jauh di sana. Yang membawanya terbang, dan terbang, dan terbang melayang ke mana pun ia mau. Ia terkesima dengan hamparan elok yang ia lihat, angin sepoi-sepoi dengan lembut menerpa pipinya yang merona, namun kemudian ia mulai bosan, ia pun membaca. Akhirnya ia tertidur. Terbuai oleh angin yang membawanya ke Lalaland. Negeri yang dihuni oleh manusia. Saat ia membuka mata dari tidurnya, dia sudah dikelilingi oleh begitu banyak orang yang jumlahnya tak pernah ia bayangkan. Ia tak pernah bertemu seorang pun sebelumnya melainkan Ibu Ikan dan Pak Kucing. Orang-orang yang besarnya dua kali tubuhnya itu ada yang sibuk berjalan dengan membawa tasnya, ada yang dengan lincah berlari-lari dengan anjingnya, dan ada yang berceloteh, tertawa, bernyanyi segala hal yang tak ia mengerti. Dunia manusia, yang bernama Lalaland itu terlalu bising untuknya. Dia merasa sangat kelelahan dan merasa tersesat, keceriaannya mulai memudar. Saat itulah Sang Pelamun(2) menemukan Gendis. Dalam kesibukan itu, hanya dia yang menyadari keberadaan gadis kecil yang tersesat seakan-akan ia akan sirna. Sang Pelamun berdiri di atas kedua lututnya untuk membuat Si Gadis Kecil nyaman berbincang dengannya. Dia membawa si Gadis Kecil ke sebuah tempat yang jauh dari kebisingan untuk mendengarkan kisah dari bibir mungil si Gadis Kecil. Ia berkata,”Segalanya baik-baik saja,” kemudian membimbingnya ke sebuah balon-kembali ke dunia di ujung pelangi. Sang Pelamun, ialah yang menjadi saksi kisah Gendis dan mengenalkannya kepada manusia. Mula-mula, Sang Pelamun berpikir bahwa ialah yang menyelamatkan Gendis. Namun, hal sebaliknya menimpanya. Saat ia bertemu si Jiwa Kecil yang tersesat itu, dia kehilangan dirinya-terjebak dalam kebekuan yang disebabkan oleh kesehariannya. Ia hampir lupa bagaimana cara untuk memeluk jiwanya. Semua kisah yang diceritakan Gendis tentang dunianya, membuatnya berhenti melakukan apa yang harus ia lakukan dan mulai mewujudkan mimpinya. Inilah bagaimana cerita ini ditulis dan lukisan itu diciptakan(3). (1) Lala adalah seorang Pisces yang setia. Kemungkinannya adalah... Ia mencitrakan dirinya sebagai Ibu Ikan dalam lukisannya. Dia selalu ada untuk Gendis... seperti halnya Gendis yang selalu ada untuknya. Ibu Ikan tidak bisa berbicara dan ia memang tidak perlu berbicara. Kadangkala, Gendis hanya perlu mencurahkan isi hatinya, didengarkan, kemudian tahu bahwa segalanya akan baik-baik saja. (2) Sang Pelamun adalah saya, dan Lala, dan kalian semua yang berkenan untuk berlutut demi berbincang dengan Gendis untuk membuatnya lebih baik dan kemudian memeluk si Jiwa cilik itu. (3) Lala Bohang menemukan Gendis ketika ia mencoba untuk menemukan jati dirinya, sebuah fase yang telah dilalui Gendis beberapa waktu lalu. Gendis selalu ada untuknya. Mereka berdua menikmati kesunyiannya. Mereka sangat romantis, bersahabat dengan baik, dan melengkapi satu sama lain. Gendis membuat Lala lebih tenang, lebih bahagia, dan lebih santai. Lala menjadi sahabat manusia Gendis yang pertama. Ketika Lala bertemu dengannya, dia sedang patah hati. Tepatnya tahun 2009 menurut perhitungan manusia. Sebaliknya, saat itu adalah saat-saat yang membahagiakan bagi Gendis karena dunianya penuh dengan cinta. Saat di mana Gendis diselimuti ketenangan dan menemukan teman sejatinya, Rama. Saat itu kemudian dikenal sebagai bab Rama dan Gendis. Kemudian, Lala menggambarkan kisah-kisah Gendis dalam lukisannya, bab demi bab. Ini adalah bab pertama ketika Gendis mencari jati dirinya di dunianya yang diam.